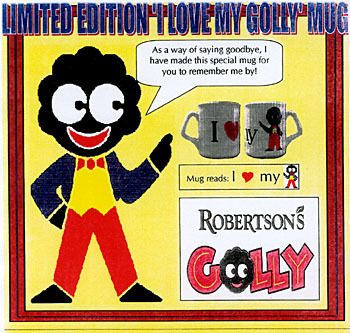 The mug was a final piece of merchandise to coincide with the 'Official' end to the scheme at Easter (however as the FAQ explains, there will be no absolute cut-off date for the brooches at Easter). It was felt that offering something new just as a final farewell to those people still interested and passionate about Golly would be appropriate. (Thanks to James Robertson & Sons) .